Back in the forties and fifties, Allard made cars. These were charismatic beasts usually propelled by large V8 engines while interesting handling was guaranteed courtesy of swing axle front suspension. Allards were always popular in motorsport and company founder Sidney Allard won the hillclimb championship at the wheel of his Steyr Allard and, most famously, the Monte Carlo rally in an Allard saloon. When car production ceased in the fifties, Allard didn't forget its motorsport connection and began offering tuned "Allardette" Anglias from their Ford dealership. Allard then moved into supercharging and turbocharging and today specialise in extracting much needed extra power from turbo diesel engines, especially those fitted to 4x4 vehicles. Extracting more power from a turbo diesel can be achieved quite simply by altering the turbo's wastegate thus increasing the boost. However too much boost means the compressed air becomes extremely hot and the density of the air reduces, thus cancelling out any benefit. Even if you have an intercooler it will be on the limit, especially on a hot day and this is where a bigger intercooler comes into the equation. 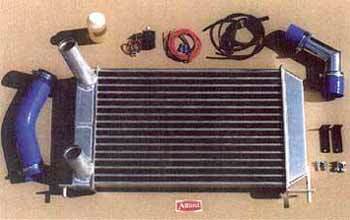 Allard have considerable expertise in this field and actually manufacture their own intercoolers. While Allard are happy to uprate almost any make of turbo diesel they offer a range of ready made kits to suit most common breeds of 4x4 vehicles. 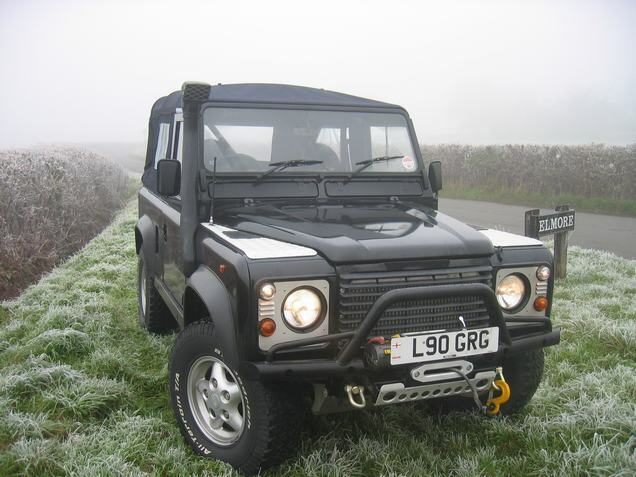 I'm not sure if it is an indication of a lack of performance from the standard Land Rover offering, but Land Rovers are far and away the most frequent visitors to Allard's Monmouth-based workshop, so we shall take a look at what is on offer for the 300 TDI. 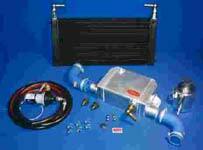 The most basic intercooler kit, Phase 2 features a larger intercooler and alterations to fuelling. Boost remains unaltered and so this kit does not put any extra stress on your engine due to lower thermal loads. A substantial increase in power can be expected, on average up to 132 BHP while torque is increased from 195 Ib.ft to 225 Ib.ft. Time to get serious now and Phase 3 offers an uprated turbo. increased boost and a giant 24 row intercooler. Rover's TDI now becomes a match for their own V8 with 143 BHP on tap and a whopping 257 Ib.ft of torque. Phase 4, Allard's most powerful offering for the TDI engine, features a water-cooled intercooler which works in tandem with the original intercooler to produce a two stage intercooler. Water is far better at dissipating heat than air. The aim when intercooling is to bring the temperature of the hot air coming out of the turbo back as close as possible to ambient temperature. This is an almost impossibly tall order, but a good example of what can be achieved is an Allard converted Golf turbo diesel, where temperature out of the turbo was reduced from 180C to 18C. When you consider that as much as 1bhp can be gained for every four degrees drop in temperature, it is worth going to some considerable lengths to achieve "ambient" temperature. Expect, therefore, to see in the near future, intercoolers incorporated into the vehicle's air conditioning system in order to chill the air. Obviously Allard can supply replacement turbos to fit yourself for pretty much any application and are also able to supply special build turbos to suit your particular needs. 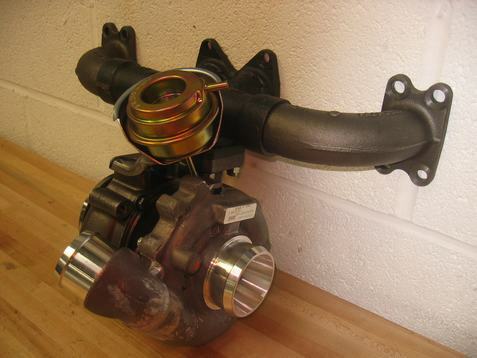 You may, for instance, want to fit a smaller turbo in order to eliminate the dreaded turbo lag. Similarly, Allard use those fancy blue silicone hoses on their conversion and therefore can provide them at competitive prices. As well as offering individual hoses of all shapes and sizes, ideal when building that off road special, kits are available for Land Rover vehicles at a similar cost to the original rubber items. All too often nowadays modern diesels have their injection systems controlled electronically, not exactly a great idea if you do any serious off roading, which is why farmers are snapping up low mileage second hand 300 TDI Land Rovers instead of buying new TD5s. 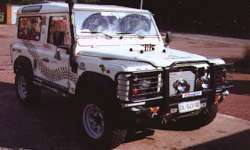 Unpopular with off roaders they may be, but tuning is made easy by fooling the ECU. For the TD5 and also that renowned slug of a motor, the 2.5 DSE Range Rover with its BMW engine, Allard are able to offer a box of tricks which simply and quickly plugs into the standard wiring harness. Just as easy to remove again, it is ideal for that company car or if you want to swap it onto your next car. A company that can make aluminium intercoolers are obviously going to be pretty useful at making all manner of other things out of aluminium and this forms another branch of Allard's business. 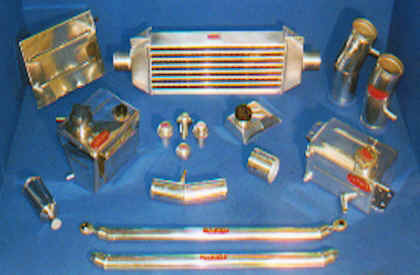 Most popular at the moment are custom built aluminium radiators, which are lightweight and efficient while other regular items are oil coolers and custom built petrol tanks, much of this being due to LPG conversions where the standard tank is replaced by gas cylinders and a smaller petrol tank needs to be made up in order to retain a dual fuel ability. Long range fuel tanks are also produced for Land Rover products. Enthusiasts of aluminium chequer plate will be delighted to learn that Allard make an entire range of chequer plate "protectors". Personally I have never understood the logic of these items. Perhaps somebody might care to explain how these things are supposed to "protect" when it is necessary to mutilate your wings with a drill in order to fit them? For me though, with Allard just eight miles down the road, somebody who can weld aluminium could prove most useful. The fact that this is to B.S.4872 doesn't really matter to me. You see I've just acquired a new off road toy which is infested with aluminium pipes feeding its aluminium radiator and intercooler. When one of these bits begins to crack or the radiator springs a leak it is comforting to know that there's a place not too far from here that knows how to fix it.